Genuine OEM HP Ink Cartridge, Photo Black. HP part number: HP 727 Photo Black, B3P23A. Compatible HP Ink Cartridge, Photo Black, . Replaces HP part number: HP 727 Photo Black, B3P23A. Compatible HP Ink Cartridge, Cyan, . Replaces HP part number: HP 727 Cyan, B3P19A. Compatible HP Ink Cartridge, Magenta, . 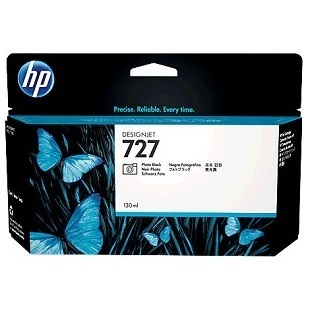 Replaces HP part number: HP 727 Magenta, B3P20A. Compatible HP Ink Cartridge, Yellow, . Replaces HP part number: HP 727 Yellow, B3P21A. Compatible HP Ink Cartridge, Matte Black, . Replaces HP part number: HP 727 Matte Black, C1Q11A, B3P22A. Compatible HP Ink Cartridge, Gray, . Replaces HP part number: HP 727 Gray, B3P24A.